It's a set of editable bookmarks I made for Get Set Go! 5 lessons devoted to dinosaurs. 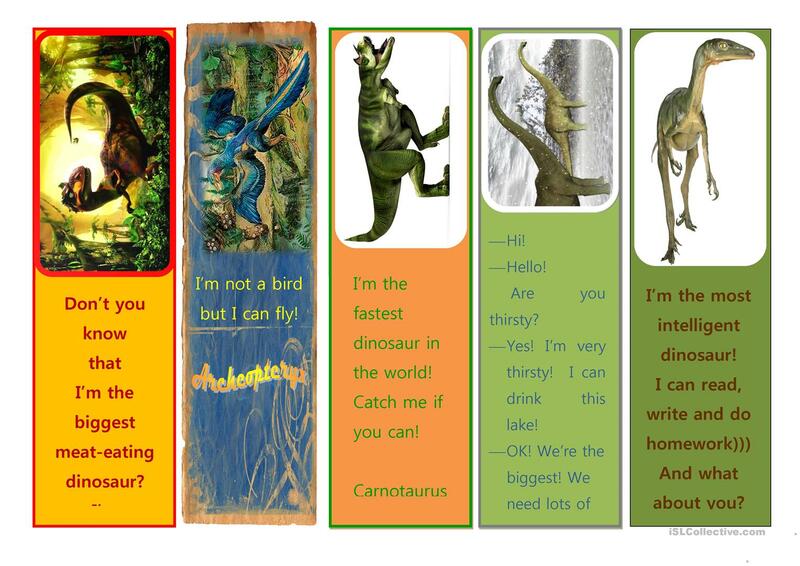 The bookmarks have been made to entertain children and to help them remember the names of the reptiles.The images used were taken from the Internet. This printable, downloadable handout is recommended for elementary school students at Beginner (pre-A1) and Elementary (A1) level. It is great for teaching Present simple tense in English, and was designed for enhancing your class' Reading skills. It features the topic and words of Animals. LiSuva is from/lives in Ukraine and has been a member of iSLCollective since 2013-02-10 22:26:41. LiSuva last logged in on 2013-04-24 22:34:26, and has shared 1 resources on iSLCollective so far.